The FOD Group website and online 'Communication Network' Newsletters are intended to be used as a worldwide resource for families, friends, clinicians, researchers and others who would like to support, educate and provide a forum for the sharing of ideas and concerns for those whose lives have been touched by a Fatty acid Oxidation Disorder. Become a member by joining our group. 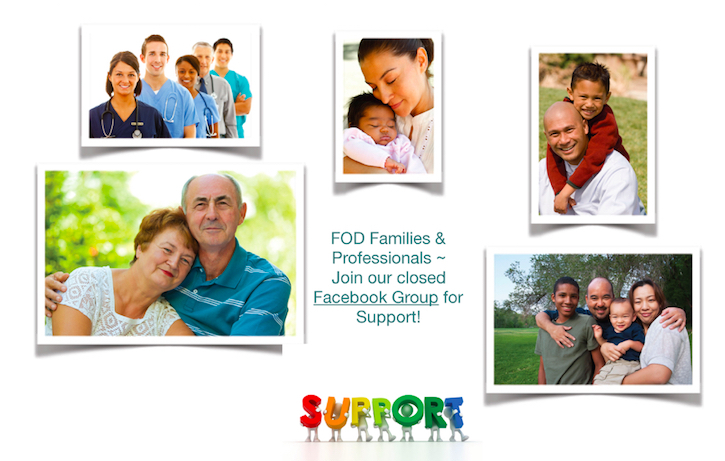 We also have an active Google email list and Facebook group of FOD Families and professionals from around the world, supporting both our new and 'old' families living with these rare metabolic disorders! Professionals ~ Please share your Expertise! Needed for future Newsletters ~ Professional articles or summaries on your clinical work or research [Drs, RNs, nutritionists, genetic counselors, social workers etc]. Contact Deb. Donations are tax-deductible – we also now accept stock donations! Make a donation or contact Deb for stock donation info. Visit our Awareness Items page to purchase FOD bracelets, FOD ribbon car magnets/stickers/window clings, tshirts, Lapel Pin and more ~ and our Donate page to find other ways to help raise funds for the FOD Group! All tax-deductible! UPDATE! FOD Study Recruitment: Patients & Families needed – refer to our most recent Newsletters. Learn about FODs and how our Group began via our Videos . If you have an FOD Story in video format and would like me to post on our FOD youtube channel, contact Deb. Excellent article honoring Dr Charles R Roe, one of our FOD research/clinical experts (retired from clinical FOD practice)! Deb offers probono Grief Support for Bereaved Parents & other adults living with loss in person (Okemos, MI) or online via zoom video (only for US). As we attend Conferences and expos, our new FOD Banner will help create awareness and educate many about FODs and NBS ~ thank you to MCAD dad, Keith Widmann for designing our banner! See past announcements in "What's New?" We are an All Volunteer national and international support group specifically for Fatty Oxidation Disorders and a 501c3 non-profit corporation [Tax ID# 83-0471342] that raises funds for the training of new FOD Professionals and for future FOD Research, as well as for our daily operations, International Meet-Ups/ Conferences, and probono face-to-face or online Grief Support for Bereaved Parents, Families, and other adults living with loss from any cause. Family Stories are shared, questions are answered, nutrition information is discussed, and medical and pharmaceutical updates are offered. You can also view and share our current FOD Brochure and Newsletter, as well as our archive of past newsletters for more information and stories. Additionally, we have videos on how our Group began and how FODs are newborn screened, diagnosed and treated. Receiving a diagnosis for a rare genetic metabolic deficiency can be very frightening for a family, especially if they know nothing about the disorder. Gaining information about an FOD is a positive step toward easing some of that fear ~ you have to know what you're dealing with medically before you can put all other ramifications in perspective. It IS possible to live a long and healthy life with an FOD ~ the KEY is diagnosing/treating it as early as possible ~ and with FODs now being screened for at BIRTH in many states/countries, more and more babies' lives are being saved! When diagnosed and treated AT BIRTH the prognosis for most of the FODs (i.e., MCAD etc) is excellent. Most can make adjustments to diet/meds when necessary during times of extra activity and illness and lead a full life. However, if undiagnosed and untreated, these disorders can lead to serious complications affecting the liver, heart, eyes and general muscle development, and possibly death. Show your support with our FOD ribbon magnets, stickers, window clings, awareness bracelets, t-shirts and baseball hats! 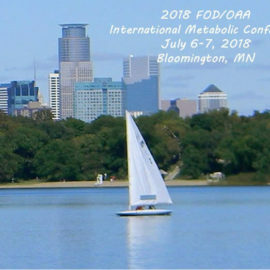 Our Group began in 1991 as the MCAD Family Support Group and then in 1996 we expanded to include all of the Fatty Oxidation Disorders (FODs). Family Stories of LCHAD, VLCAD, CPT and other FODs begin with the June 1995 issue. In our early years, when each new Family contacted us, we used to mail out a Family Packet of past newsletters ~ but, we have discontinued mailing newsletters in the US and abroad due to high copying and postage costs. That is why we now offer all of our past and present newsletters online.